I was surprised to note that this book was written in 2003. I felt that it was much more recent than that, and I see that it is about to be released as a movie later this year. It was my selection for my face-to-face bookgroup, and I was rather dismayed that we did it while I was overseas, thus missing our meeting. It was the first book that I have purchased for my e-reader, as distinct from the freebies that either came with the reader or that I have downloaded from Internet Archive. It was rather distressing then, to find that it disappeared from my reader when I had to recharge its batteries through the computer. I’m not really sure how to get it back: I had downloaded the original on my computer at home, and there was a message about not being able to download it in Canada- obviously ‘they’ had detected that I was in Canada now. Most curious. I was about 300 pages, and really wanted to finish it, so I ended up buying a hard copy as well. So I guess that you could say that this first foray into purchasing an e-book was not an unqualified success. The fact that I wanted so much to finish it says much about the book. For about the first 100 pages I was really annoyed by the volubility of this narrator- did she have to go on and on about everything? Surely Franklin, her estranged husband, would never read these lengthy, detailed letters! The letters are arranged chronologically, and speak to Franklin as “you”. 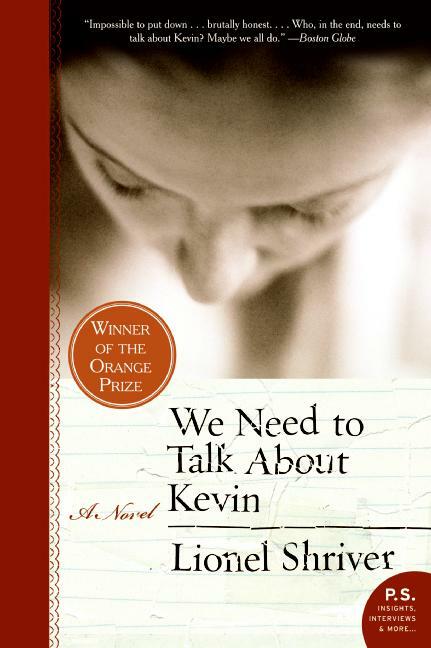 They are a form of confession and catharsis as she re-lives her relationship with her son Kevin. From the outset, she was ambivalent about Kevin: she was undecided about a pregnancy because of her success with her travel-guide company ‘On a Wing and a Prayer’, and she resented her husband Franklin’s overwheleming solicitude for the baby. Both these tendencies intensified as Kevin grew from baby, to boy, to adolescent: Franklin could see only good in his son, Eva could see only manipulation and malevolence. I’m not sure at what point my frustration at Eva the narrator dissipated. It was probably as Kevin became more and more chillingly evil. The small details of his malevolence were, in many ways, the most disturbing. We are told in the first pages that Kevin will end up perpetrating an atrocity at his school, and the book slowly, but inexorably, moves towards that point. I’m sure that the ladies-who-say-ooh in my bookgroup would have discussed motherhood and our ambivalences about our children, and the contribution (if any) of the family’s dynamics to Kevin’s personality. I’m sure they would have discussed the nature of evil, and whether it is ever inherent, and how the trajectory of Kevin’s crime unfolded. I wish I’d been there for the discussion. Reason read: My face to face bookgroup.